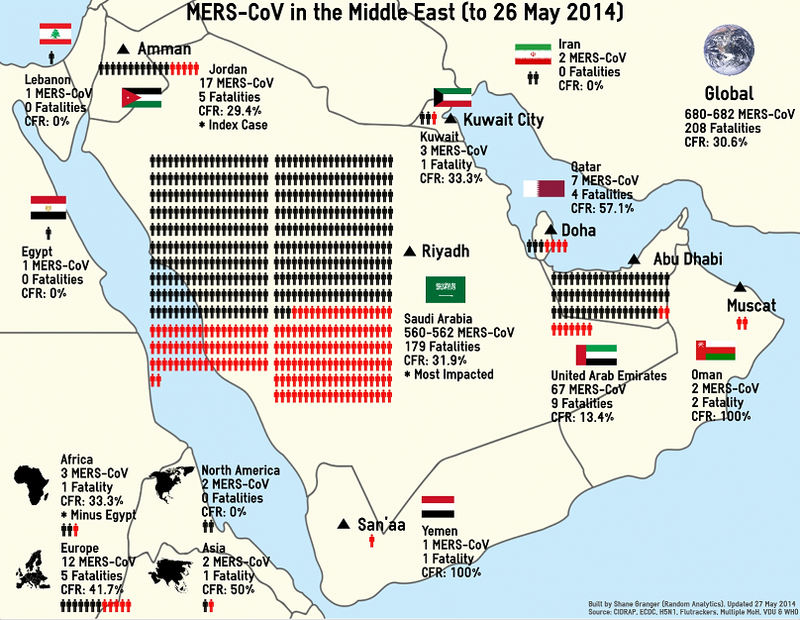 MERS-CoV has just hit Iran for the first time so I was trying to get the most up-to-date information on the virus spread but all the numbers are a little dated or tainted at the moment so I thought to make sense of it myself. The above infographic is a look into the MERS-CoV with specific emphasis on its cases within the Middle East. The data is taken primarily from the latest ECDC update along with the current update from the Saudi Arabian MoH (to 26 May 2014) plus a little guesswork from myself (see appended). Unfortunately, given the five day delay in the most recent ECDC update (and errors within that update including an incorrect total of deaths in KSA) I wasn’t able to match the 680-cases (as per FluTrackers) to the public sourced data. Nineteen cases have been reported from outside the Middle East: the UK (4), France (2), Tunisia (3), Germany (2), USA (2), Italy (1), Malaysia (1), Philippines (1), Greece (1) and Netherlands (2). In France, Tunisia and the UK, there has been local transmission among patients who had not been to the Middle East, but had been in close contact with laboratory-confirmed or probable cases. Person-to-person transmission has occurred both among close contacts and in healthcare facilities. No one’s numbers agree so I’m looking forward to the next ECDC update so I can work out the anomaly. That aside, given the newly reported cases in Iran I felt the infographic needed to be updated just to highlight its continuing international spread.